Yesterday’s match at Pittodrie was the big litmus test of recent months for Steven Gerrard’s Rangers. An excellent 2019, which, incidentally, only has one loss recorded so far, had seen recent form escalate to unseen levels if measured only in the past seven or so years. However it was evident its big barometer was how it would cope yesterday at a feisty Pittodrie, with a real step up from your Dundees and 10-man Killies. And in blunt honest truth, the side to hit so much form in recent weeks hit a real bum note yesterday -and it’s in part due to the players’ failing to hit the heights of late, and also due to Steven Gerrard’s selection of Borna Barisic, not to mention failure to change things beyond Ryan Kent’s flank. We have certainly noticed that, in the majority, Gerrard struggles when the chips are down – he struggles to make changes which manifest in turnabouts. Sometimes he does – Defoe’s introduction at Pittodrie a few weeks ago helped seal the deal in the league. But in this one, Gerrard was a bit impotent. 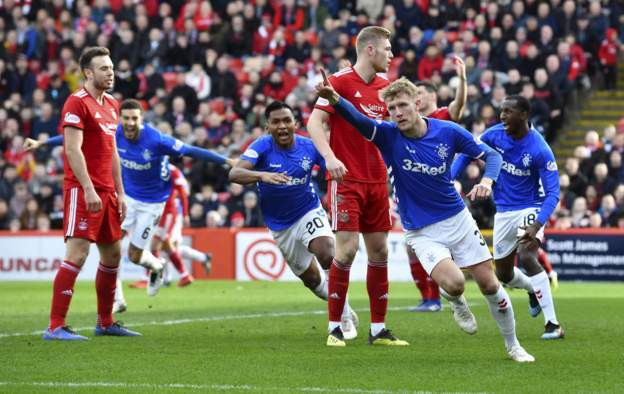 As were the players – from the first whistle, Aberdeen wanted it more, and Morelos decided to pick this match to play his petulant and whiny self – and was rightly booked for a pretty embarrassing dive. Perhaps he saw the disgusting banner, yes, and it was absolutely f****** ugly even by the vile standards these days of Scottish football, but equally he’s a professional with a job to do and his head and heart were not in it from the start. As for Barisic, we’re by no means scapegoating him at all – he was anonymous as per – he’s the wrong player in the wrong team in the wrong league and we’d be happy to see the back of him come the summer, but it’s not his fault Stevie signed him and it’s not his fault Stevie picked him in error yesterday. Halliday should have started, and that’s absolute. 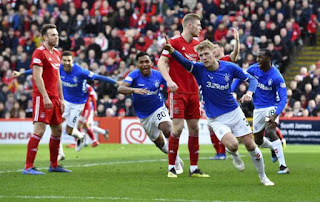 But yes, the whole team, a few players aside (McGregor, Worrall, Candeias) had pretty weak and uninspired games – and if the players don’t produce on the pitch on a grand occasion like a cup quarter at Pittodrie, it’s a bit worrying. It’s worrying for Stevie to see his players fail to show on such an important match – we can accept losing to a better team, or drawing with one who fights equally to us – but Aberdeen pretty much outdid us physically and should have scored a couple through sheer pressure – the only feasible away goal opportunities were on counters and sadly Stevie’s men were lacking incision up front. It was an all round bummer, let’s be frank. Stevie didn’t quite deliver and neither did the players. This, we can view, as a bad day at the office and a cost-free opportunity to get a stinker out of the system – after all, we get a second bite at the cherry and we’d anticipate a much better performance. Stevie and Rangers used a real get out of jail card yesterday – but then that’s what they’re there for. Actually it was a good day at office. Means we will rake in an additional £0.5m ( minimum) and progress to semi final. For the first time this year SG plays same team for 2 games on trot and IN criticises him having spent all season moaning about him rotating team selection. The players we signed in summer were done so in a rush as we were playing in Europe long before window closed( it is stupid beyond belief that season starts before window closes). So although SG approved them all he couldn’t have had time to assess them all. This summer will see a better window. We need SG to drag us up. He may be inexperienced but he knows more about football than any manager in Scotland. Get behind SG!!!! Haliday would have made no difference what so ever, dunno how or why your trying to blame barisic, he was average at worst, maybe if the forwards learned the offside rule, we would of had a couple easy goals. Don't know what is wrong with Barisic, a mere shadow of the player we signed. I thought Halliday, is fit was a certainty to come on a half time, he links so much better with Kent and is a more comfortable player with the ball. I don't know what to say about Morelos, perhaps the banner got to him but he could easily have been hooked early. We have another chance to put things right against this really poor Aberdeen side, they really are a horrible team to watch, long ball merchants. Don`t know why you insist on scapegoating certain players , if its not Worrall , its Kamara or Barisic. I agree he didn`t play well but that not the reason we drew ) not lost) a very difficult cup tie . I suspect that Halliday is not fully fit and thats why he didn`t bring him on .We do struggle against physical teams sometimes but if the way to beat it is to sign that type of player and personally I have no interest in watching guys like Shinnie , McKenna, Cosgrove kick their way around Scottish football.A bit of protection from refs when we are trying to play would help .By the way Kamara had a much better game than Candeias . Like some others, I think we should pause a little. We played poorly, very poorly. But we survived, away from home. If we play as badly on Friday and next Tuesday, we will be out of the League and the Cup and it will be time for an inquest. But I don't think we will. I,m sure Stevie G will heed the advice of everyone on here (not). All you get on here is critisism, and to think you call yourself Rangers fans. Yesterdays scapegoat Barasic is not used to the pace and physical nature of our game but i,m sure your critisism will do him a lot of good(not). Firstly, please don't use capitals, we can all read small letters. Secondly, I don't want to go changing managers again. So I think we should give SG a bit longer before we bring out torches and pitchforks. ferguson was not great first couple of years at Man Utd. Do you think they look back and wish they had binned him? I don't. Funny how Rangers having a 'bad day' always seem to coincide with them playing the bigger teams, in the SPL. Barisic 'needs', to be scapegoated. He's been absolutely rank rotten, of late. Not acceptable and definitely WON'T be tolerated, next season. Empty jerseys! Not sure we need backup RBs. We have Flanagan, who is no great LB but a decent RB, and Matt Polster. Firstly a draw at Aberdeen has never been a terrible result. Secondly I agree we had an off day and in the first half in particular we didn't appear to be up for the fight which was disappointing. Thirdly there are some good reasons I believe why we never performed. The poor pitch and tricky weather which was referenced by the panel certainly played a part. It didn't affect Aberdeen to the same degree as they were content to punt the ball long and fight for the scraps. Morelos was badly curtailed by his early stupid booking and was clearly walking a tightrope with referee Clancy who was just itching to send him off. Then there was the tight pitch which didn't allow us to spread the pitch and get our full backs overlapping and stopped us getting the ball to Kent and Candeias in good space. I also thought Goldson played poorly which put us under pressure at set pieces. These things can all be corrected in the replay but we must approach the game the same way as we did against Ceptic in December and go out and blow them away. Think Halliday was struggling with a knock so in my opinion he picked the right team. First half was poor played far too many square passes and build up was way too slow. Was surprised they didn't put Lafferty on and gone a bit more direct second half especially since the biggest threat we had was from counter attacks.